In an earlier post, I (David) shared 5 Blind Spots Educators Must Address. 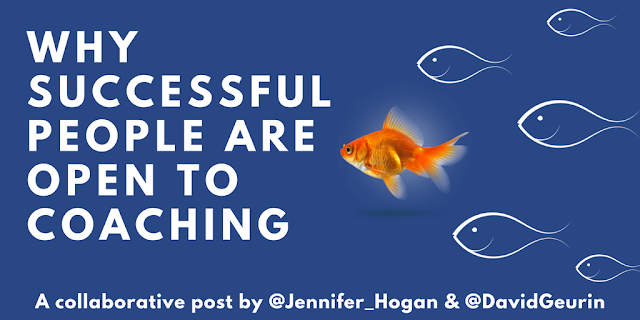 My friend Jennifer Hogan commented that one way to overcome blind spots is through coaching. That conversation led to the idea of writing this collaborative blog post. If we truly want to grow, we have to seek evidence of things we might be doing that aren’t working. Sometimes we might not want to look too carefully at something because we might find something we don’t like. But that type of thinking will always hinder our performance. John Hattie urges educators to “know thy impact.” Seek evidence to understand what’s working and what’s not. Hattie focuses on collecting evidence regarding one’s impact on student learning. Coaching can help us reflect on and process what we are doing and how it is impacting student learning. When we better understand what’s working and what’s not, we can focus our energies on highlighting the strengths and mitigating the weaknesses. What happens when we don’t open ourselves to receive coaching? I want to hear from you. Leave a comment below or respond on Facebook or Twitter.